Dashlane password manager keeps track of all your passwords and makes sure each one is unique, strong, and secure. SafeWise tested Dashlane to find out if it’s easy to use, how secure it is, and why you’d want to upgrade to the Premium plan. When it comes to passwords for online accounts, I know all the rules that make them secure—but I’m not good at following them. I had mixed feelings about trying out the Dashlane password manager because it felt like I was giving up control of my accounts and credentials. What I learned is that I could finally say goodbye to the hassle (and risk) of forgotten and weak passwords. Dashlane took care of everything—from storing my passwords to generating new ones that are unique and more secure. I’d never used a password manager before, and I was happy to learn how simple and unobtrusive Dashlane is. It has a few automatic features that I had to work around, but it was easy to find solutions and change the settings to suit my needs better. And Dashlane offers extras like a digital wallet (online shopping, here I come! ), multi-factor authentication, and cross-platform password management—that means it works on your computer and your phone. When you opt for Dashlane’s free password manager plan, you won’t be tricked into a monthly subscription. All you have to do is click on the “Get Dashlane” button, and your password protection starts immediately. There is no request for credit card info, which I found refreshing in a world where nearly every “free” thing I sign up for asks me for payment information that I’ll have to remember to cancel after the trial period. Whether you decide to stick with the Free plan for life or upgrade to Premium, you get all the basics you need to feel good about the security of your passwords. The Password Generator is a basic feature, and it’s one of the most valuable if you’re someone (like me) who’s been using slight variations of the same password for years. And even though the Free plan covers only one device, that device gets all the main perks you want in a password manager. Even though you get all of the essential features in the Free plan, you only get to use them on one device. That means you can’t sync your password manager with your smartphone, tablet, or other mobile devices. In an age when most of us use at least two devices, this is a major drawback. There are a few different ways to buy a Dashlane Premium plan. If you go to the main website, you’ll see the plan listed for $3.33/month. But if you go through the Dashlane app on your phone or PC, you’ll get the annual plan options listed above. After further investigation I verified that even though the monthly price is listed, you have to pay for a year’s subscription. Signing up for Dashlane was so fast that I wasn’t even sure I’d really done it. I entered my email address, created a password (more about that later), and started the download. Dashlane’s installation is so automatic that I was a bit dizzy from the experience. After you download Dashlane, the next step is to add the Dashlane browser extension—it works with Chrome, FireFox, Internet Explorer, and Edge. Then Dashlane asks if you want to import any passwords you have stored in the browser. Because I wanted to see the ins and outs of how Dashlane works, I didn’t opt for the import. Even without that shortcut, it was easy to save new passwords every time I logged into an account for the first time after adding the Dashlane browser plug-in. Dashlane is compatible with PCs, Macs, iOS, and Android. I used it on my MacBook and my iPhone, so I can testify that Dashlane works well as a cross-platform password manager. At first, I wasn’t sure I wanted to download Dashlane onto my phone, but it was as simple as sending my phone a link to the Dashlane app and clicking on it. Granted, if I don’t upgrade to Premium after the trial period, I’ll have to pick either my Mac or my phone if I want to keep using Dashlane. The Dashlane dashboard is attractive and intuitive to use. The menu is located on the left side of the screen and features three sections: Password Manager, Wallet, and Contacts. My favorite is the Security Dashboard, which gives you a security score based on the strength of your passwords and whether any of them are compromised. You can see which accounts need a stronger or new password, and it calls you out for using the same password on multiple accounts (my bad!). If you’re not in the app, you can access a scaled-down menu from the Dashlane browser plug-in. This modified dashboard lets you view the accounts for which you’ve saved passwords, and you can generate new passwords for accounts without having to open the full Dashlane app. If you do want to get into the full dashboard, all you have to do is click on the ellipsis in the browser menu, and it gives you options that launch the entire app. One of the reasons I was hesitant to use Dashlane on my iPhone was my strong attachment to Touch ID. I love being able to open apps with the touch of a finger instead of typing out a complicated password on a tiny keyboard. Before downloading the Dashlane app, I made sure that it wouldn’t wipe out my Touch ID. Much to my delight, I found that not only does Dashlane let me keep using Touch ID but it also lets me use Touch ID for my Dashlane app password. And, for those with an iPhone X, Dashlane also works with facial recognition. I like to win at things, so when I discovered I could get a grade on the strength of my passwords, I accepted the challenge. From the Security Dashboard, you can click on Password Strength, and it takes you to a detailed analysis that rates each password. It considers how easy it would be to crack the password, along with other factors like whether or not you use the same password for more than one account (guilty!). I’d like to point out that I did get one 100% safety rating. This feature brings home how well you’re protecting your identity and other personal information. 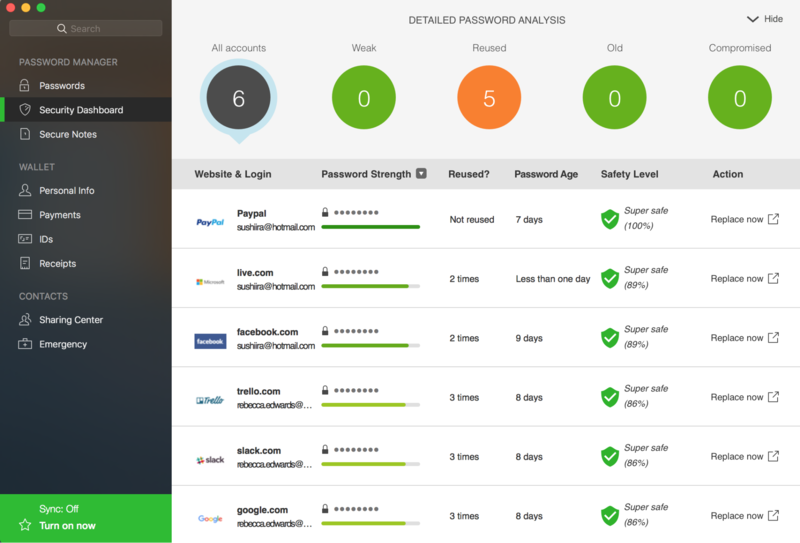 After reviewing your password analysis, if you decide it’s time to get serious, Dashlane will do the heavy lifting. One of the reasons I reuse the same password is because I can’t trust my brain to remember a super-secure password that isn’t based on any favorite books or TV shows or even real words. But with Dashlane keeping track—and generating tricky passwords for me—I’m ready to give up my risky, lazy ways. One click on the “Generator” menu option and all you have to do is copy and paste the generated password into the selected account. You can even select which password elements you want to include—letters, digits, or symbols—and you have the option to avoid ambiguous characters (like substituting a zero for the letter “O”). The more elements you add, the safer the password. I tried generating passwords without symbols and got a “fairly strong password” result instead of the “strong password” verdict shown above. If you do a lot of online shopping, you’re going to appreciate Dashlane’s digital wallet feature. You have the option to securely store payment information like credit cards, PayPal, or Venmo. It may seem risky to save financial information in an app, but Dashlane encrypts all the data you enter with your master password, which only you know. The company doesn’t store your master password on its servers, and it uses the most secure form of encryption available. The primary benefit of saving your payment information in Dashlane is fast, secure checkout when you’re shopping online. Forget running for your wallet when it comes time to pay—you can autofill checkout fields without even touching your keyboard. Call me morbid, but I’ve wondered about what would happen to all of my online accounts if I were no longer alive to manage them. Dashlane has also considered this inevitability, and they have a solution. You can add an emergency contact to your Dashlane account, which means that a person you trust will be able to access your Dashlane account and view password and notes data. Emergency contacts don’t have access to anything stored in your digital wallet. You can also limit the data an emergency contact can access, and you can revoke access at any time. The one caveat to this feature is that your emergency contact needs to install Dashlane on their device before they can access your account. Before you even download the Dashlane password manager, you have to set up an account. To get started you have to enter an email address and a password. 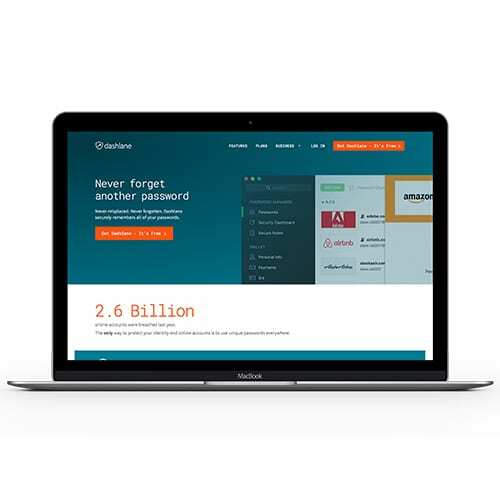 Dashlane gives you some guidance about the password you choose, suggesting that you include at least eight characters, both upper and lowercase letters, and one number. What Dashlane doesn’t tell you is that this will be your master password—the key to access everything in your Dashlane account. If I’d known that, I would have used a much stronger password. This is a security feature that took me by surprise. In the midst of Dashlane’s setup tutorial, I had to go to a meeting. When I returned to my desk, I sat down to work as usual. To my surprise, I was logged out of absolutely everything on my computer. I had to manually log back in to every account I was using. As I logged in, Dashlane asked me if I wanted it to store the password. While I was happy to get all of my passwords saved, it was inconvenient (and somewhat disturbing) to have this app take over my computer.I quickly searched for ways to deal with this security feature and found plenty of other users who also wanted to know how to turn it off. Dashlane defaults to the automatic logout setting, and you have to go in and manually turn it off. This adds extra security, but this setting should be part of the tutorial that takes you through the password manager setup. That would save panic and frustration when you find yourself logged out of everything every time you need to walk away from your computer. One of the features that Dashlane seems pretty proud of is secure sharing. When you activate this feature, you can share passwords to designated accounts with approved people. I wanted to see how well it worked, so I gave my boyfriend two different levels of sharing access. The catch is that he has to set up his own Dashlane account to gain access to the info I’m trying to share with him. The same goes for setting him up as an emergency contact.This was frustrating, especially because installing Dashlane automatically affects your system settings, e.g., logging you out of everything. 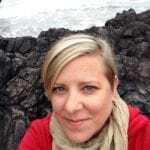 When I sent an invitation to my boyfriend to access my account, I expected him to be able to do so through that invitation—without forcing him to create an account. 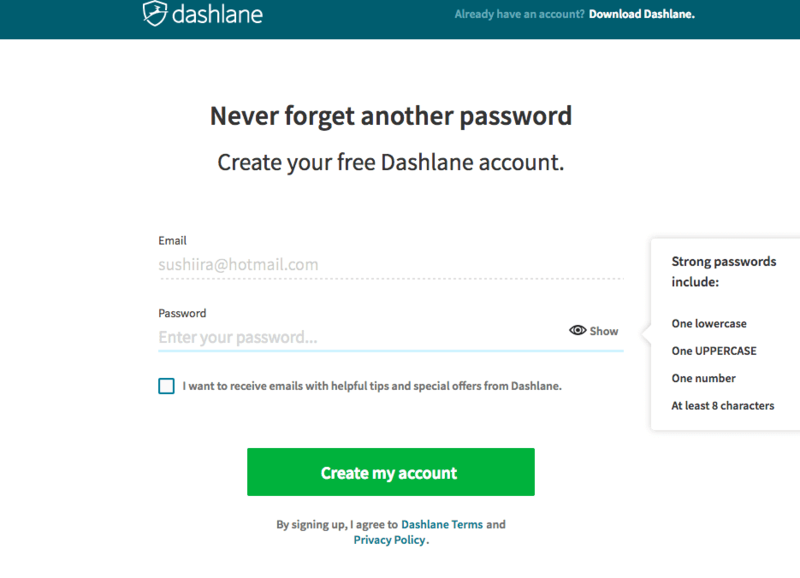 Requiring others to set up an account is clever on Dashlane’s part, but it’s kind of sneaky (and disappointing) for customers who want to use the secure sharing or emergency contact features but don’t have people who want to use Dashlane. What are Dashlane’s technical requirements? What is the Dashlane master password? This is your key to all the information you have stored in Dashlane. It’s the one password you need to remember so you can access your Dashlane account and all its data. You create the master password when you sign up for a Dashlane account, and Dashlane doesn’t store it anywhere on its servers. That means you need to make sure you remember the master password, because there is no recovery function in Dashlane. Don’t use symbols in your master password. Not all keyboards are the same when it comes to symbols, and you could find yourself unable to log in. If you forget your master password, you will need to reset your entire Dashlane account. When you create a new master password, all the information currently stored in Dashlane is wiped. It doesn’t delete your account or affect your subscription, but you won’t be able to decrypt any of the information you have saved. You’ll have to start all over saving passwords, payment information, and any other data you had stored in Dashlane. Yes. If like me, you didn’t realize that the first password you entered to start your Dashlane account would be the key to all your sensitive data, you can change it. Why should I upgrade to Dashlane Premium? If you’d like to use a password manager on more than one device, then Premium is the only way to do that with Dashlane. One other major benefit is unlimited backup of all the data you have stored in Dashlane—this includes payment info, receipts, and any secure notes you’ve saved. Premium also lets you automatically sync all of your data across your devices, so your information will always be up to date, no matter which device you’re using. Dashlane is an easy-to-use password manager that you can get without breaking the bank. The simple setup and intuitive dashboard make this tool a good option for the tech-averse and tech-savvy alike. It has a few quirks (automatic logout) that may take a minute to get under control, but once Dashlane is up and running, you can forget about it—along with all those tricky passwords you can never keep track of. To review the Dashlane password manager, I installed it on my Mac and my iPhone. I used the password manager for two weeks to get a good feel for how it works, find out what I liked, and learn which aspects weren’t my favorite. I also conducted research, consulted other expert reviews, read customer testimonials, and went through Dashlane specs, FAQs, and instructions with a fine-tooth comb. For more info about how we review products and services, see our Methodology page. Dashlane for me has broken. I’m a premium user and can’t get it to work properly. One comment said to take out the dashlane extension in Chrome. I did and I still can’t get it to work as it has in the past. Please fix it. Don’t make me go to another service. The help page is not a help page. It’s a plan to make you run around asking and answering questions until you finally give up. I have been trying to get to the web version, but you have to login with you email address. You enter the email address and it goes to an error page. Three time it has asked for my email address to send a code to to contact someone and the email is never sent. I’m about to give up. If someone doesn’t contact me to help me get it fixed, I will be forced to try anouther app.